CLEVELAND - The Greater Cleveland Regional Transit Authority (RTA) will complete a $6.8 million Red Line track upgrade this fall. This will eliminate some speed restrictions -- more commonly known as "slow zones" -- and track speeds will be increased. The track will be upgraded between West 98th and West 30th streets, from Sunday, Nov. 5, through Saturday, Dec. 2. For four weeks, from Nov. 5 through Dec. 2, buses will replace Red Line trains between the West 117th and Tower City stations. 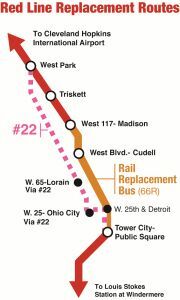 The 66R buses will operate via a direct, special alignment and serve only the West 117th, West Boulevard and Tower City stations. 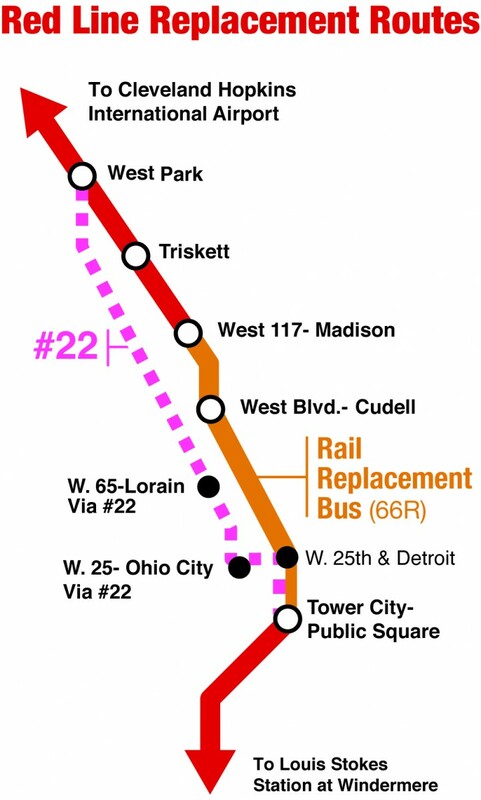 66R buses will also stop at the intersection of Detroit Avenue and West 25th Street, to facilitate connections to and from buses that serve the West 25th Street Station. The Tower City stop will be on West Prospect Avenue at West 3rd Street. Stops for the West Boulevard Station will be on Detroit Avenue, not inside the station bus loop. These adjustments will help move riders to and from Downtown as quickly as possible. Eastbound passengers who board the Red Line west of the West 117th Street Staiton will transfer from the Red Line train to a 66R bus at the West 117th Street Station, and head Downtown. Westbound passengers who board the Red Line east of Tower City will transer to a 66R bus on West Prospect Avenue at West 3rd Street. At the West 117th Station, they will transfer to the Red Line. To speed the boarding process, fares will not be collected on replacement buses. All doors will be used for boarding and alighting. On the Red Line, normal fare collection procedures will be used. If you ride both segments of the Red Line, keep your proof-of-payment handy throughout your entire Red Line trip. A new Red Line timetable is available for this service modification. The span of service remains the same. The project could add up to 20 minutes to a one-way commute. To reach the West 65th Street Station, ride the 22 bus. To reach the West 25th Street Station, ride the 22, 45, 51, 79 or 81 bus. Use the on-line trip planner, or call the RTAnswerline, 216-621-9600.